THE CANADIAN PRESS -- VANCOUVER - Stories have been mounting of people photographed and videotaped in the chaos of Vancouver's Stanley Cup riot who've had their lives upended — lost jobs, endangered sports careers, physical threats, online ridicule. It's only likely to grow, as an online public shaming campaign yields more photos and names every day and police prepare to use some of those images as evidence in criminal cases. The phenomenon is raising new questions about privacy and surveillance in a world where few public spaces are free from the gaze of a cellphone camera, particularly when those public spaces turn into crime scenes. It gives both police and online vigilantes new ways to easily identify their targets. 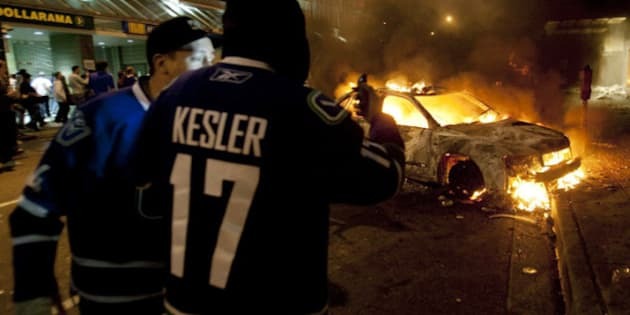 The melee spanned several hours last Wednesday after the Canucks lost to the Boston Bruins, as jersey-clad rioters set fire to cars, smashed windows and looted stores, causing millions of dollars in damage. About 150 people were injured and there have been more than 100 arrests. Before the night was over, websites and Facebook groups had already sprung up to help identify the perpetrators, using the countless photos and videos from onlookers and media reports. Vancouver's police department has received thousands of tips and photos and investigators are asking the public for more. The police are also warning people not to take the law into their own hands, with some alleged rioters complaining about threats, even going into hiding. Josh Greenberg, an specialist in social media at Carleton University in Ottawa, says social media have given rise to a new form of surveillance. Rather than Big Brother watching the public's every move, citizens are equipped to watch each other. Greenberg says when cellphone pictures are sent to the police, it's not much different than witnesses coming forward or calling Crime Stoppers with tips. He doesn't see any major privacy concerns with that. But the real danger, says Greenberg, is how citizens have been using those photos and videos online, effectively meting out punishment before the police and courts figure out what actually happened. The online pressure has been so great, some young people who've been subjected to it have offered public apologies. "A lot of people are leaping to conclusions that people were involved in the commission of a crime but police and the criminal justice system have the ability to make those determinations," says Greenberg. "There have been examples of citizen vigilantism in the past, there is nothing new in that regard. What I think is different with the current case is the speed at which it is happening, the ubiquity and the visibility." On the other hand, there may be positive spinoffs from the high-profile online shaming rioters have endured. Now that people know the consequences, they may think twice before behaving badly in public. "The scale of the response has been far greater than any in the past," says Greenberg. "It's the kind of event that will service as a bit of a wake-up call for people that what they do in public does bear some consequences." It's unclear how useful the eyewitness photos and videos will be in convicting the alleged instigators of the riot. Vancouver-based criminal lawyer Eric Gottardi says police and prosecutors will need to use photos along with other evidence, including eyewitness testimony, to prove cases beyond a reasonable doubt. Defence lawyers and prosecutors will argue over what a photo actually shows. For example, is the person in the photo stuffing a rag into a gas tank or pulling it out? Many of the photos circulating on the Internet are even more ambiguous, says Gottardi. "You move to the outliers, where all you have is one photo of someone posing in front of a burning car or in front of a broken window," says Gottardi, who chairs the criminal justice section of the Canadian Bar Association's B.C. branch. "What is the photo evidence of? Is it evidence of mere presence at the riot? If so, I think the Crown will be hard-pressed to lay any criminal charges." Police will also have to be wary of any photos that may have been edited or doctored and the photographers themselves may be required to testify. As for the online shaming, Gottardi says that may have legal implications as well. Bloggers and social media users would be subject to the same restrictions as reporters, such as publication bans. That becomes particularly dangerous if alleged offenders are under 18, in which case it would be illegal to publish their names and photos if they're charged. "It's certainly a new phenomenon and I think the law is really going to have to wrestle with how to deal with this," says Gottardi. "The people may not realize that they're in fact publishing these things by putting them on the Internet. Things they publish on their (Facebook) wall, their photos, their statements would be subject to the same laws that the media is subject to."